The very first University of Miami All-American in women's golf, Judy Eller, was making national headlines with her tremendous on the golf course before the University of Miami even sponsored women's golf as a varsity sport. A native of Old Hickory, Tennessee, she captured the Nashville Women's Open Championship at the age of 13. After enrolling as a non-scholarship athlete at UM in 1958, Eller soon became dominant force throughout the intercollegiate scene. In May, 1959, she won the forst of two consecutive Southern Amateur Championships and in June, 1958, she became the first Hurricane female athlete to win an individualchampionship, capturing the US Women's Amateur Championship. 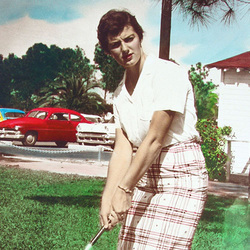 In May of 1960, Eller was selected to compete for the United States at the Curtis Cup team competition against the British team in Lindrick, England. As a 19 year old sophomore in college she was the youngest member of the US Curtis Cup team and she scored the deciding individual win the the American victory. Judy Eller is probaly one of the finest golfers to ever play for the University of Maimi.